Established 2018 in a collaboration between Swim Open Stockholm and Bergen Swim Festival. 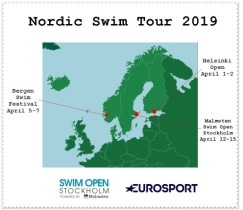 finnish event Helsinki Swim Meet will complete Stockholm and Bergen in the Nordic Swim Tour ! The A-finals in all the three meetings will be broadcast by EUROSPORT in all the European territorium. swimmingstars live! The productions are done and the rights are owned by Springmedia. Helsinki Swim Meet offer a total prize of €25 000. Bergen Swim Festival offer a total prize of €28 000. Malmsten Swim Open Stockholm offer a total prize of €64 000. The best swimmers in twelve different events who has competed in all three meetings get €1000 each. The total sum of prizemoney in the Nordic Swim Tour is €129 000!